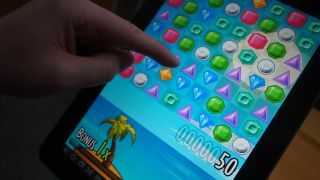 Android smartphone and tablet owners are now spending more on games than is being outlaid on software for the Nintendo 3DS and Sony PS Vita consoles combined, according to a new report. In more bad news for Sony, and especially Nintendo, spending on games on the Google Play has increased while revenue from games for dedicated handheld consoles has gone in the other direction. Perhaps even more worrying for the console makers were the findings that the majority of Google Play spending took place in the Asia/Pacific market, including Japan, which is home to both Sony and Ninty. Way out ahead of everyone is Apple, according to the quarterly AppAnnie and IDC Portable Gaming Report, underlining iOS' position as the dominant handheld gaming platform. In a post on its site, AppAnnie wrote: "In this Q2 2013 report, we offer insights into the continued shift of consumer spending from gaming-optimized handhelds to mobile devices." It is also marketing the device as a home for indie developers to easily self publish their wares and have secured a host of exclusive titles. Will these moves improve the PS Vita's chances of a life less ordinary? Let us know your thoughts in the comments section below. Check out more of Sony's announcements from Gamescom 2013.